The vaults are situated in the Water Garden and are made of grey granite. The tablets inscription is highlighted in 23 ct gold. Each vault has room for two urns. A photo plaque can also be added as well as the option for engraved images. 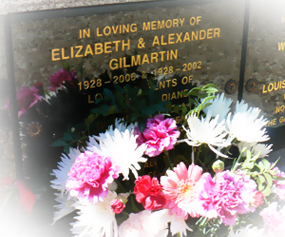 We provide a flower container and our gardeners will remove dead flowers for you. In order to maintain the overall look of the area please do not place any other items in front or on top of the vault. The vault is leased for 10 years and you may renew this at the end of the period. There is room on the tablet for up to eleven lines of inscription, however, before using all of this you should consider whether there will be sufficient room should you require a second or additional inscription in the future. Click here for our current charges.